As Spring gives way to Summer, thoughts turn to a day that honors the Fathers in our lives. Whether it is their First Father’s day or their twentieth Fathers Day, Memorable Gifts has the perfect gift idea that will show how special he is to you. Father’s Day is June 21st, make it a day he won’t forget. Here are 10 of our most popular gift ideas to show him just how much he is appreciated. This brown wooden frame will remind the new dads of their first Father’s Day for many years to come. This frame has “Our First Father’s Day” written across the top, and the sides are adorned with images of baby bottles, diaper pins, and spoons signify this special event. To make this item one of a kind, their names and the day are written across the bottom. This will be a treasured keep-sake honoring the first Father’s Day for any Father. Is your father a bit disorganized? 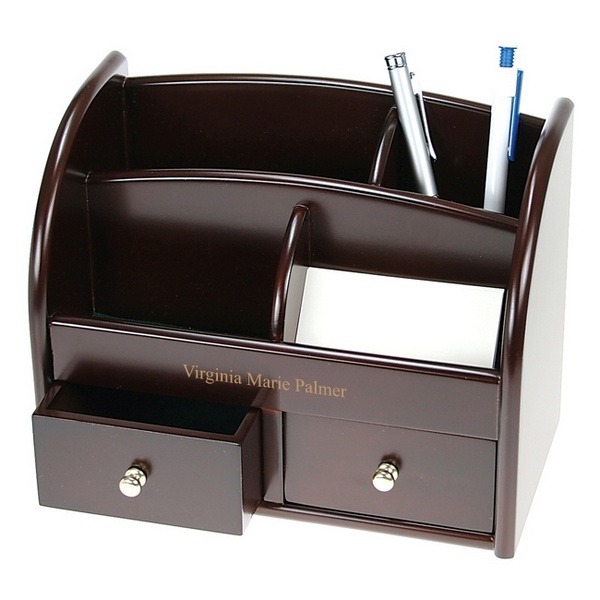 This Sophisticated Rosewood Deluxe Desktop Organizer could be just the thing he needs to bring that clutter together for him. With the personalized initials on the center, this organizer will be a treasured gift for years to come. This handsome organizer has a place for all the items he wishes to keep within reach. This Silver Money Clip may be the gift idea of the year. What man would not enjoy replacing the thick, traditional wallet for this slim, silver money clip which keeps his ID and money within reach? No more rummaging through his wallet at the check out counter. With the personal touch of having his name, initials, or sleek lines etched around the edges, this one of kind Father’s Day gift, will be treasured for years. This Father’s Day Iceberg Plaque can be personalized with a heartfelt message message of your choice. This will be a one of a kind gift for Dad. The plaque will hold a special place on his desk to remind him how much he means to you. 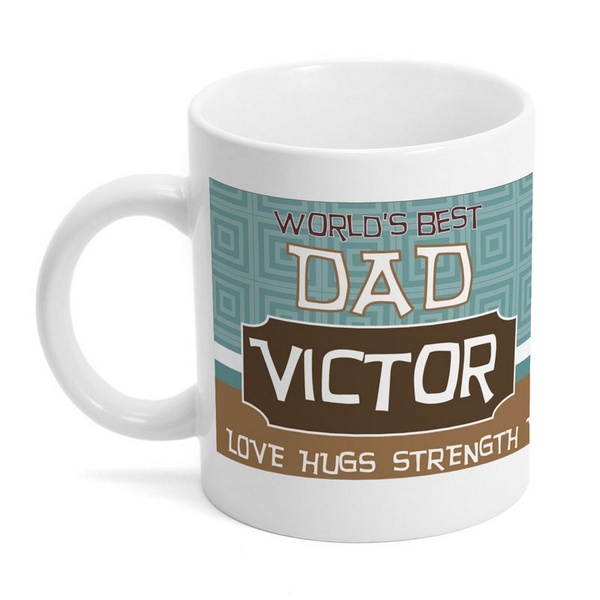 This mug with make any dad’s coffee break a special time of enjoyment. Your father will be reminded every day just how special he is to you. By adding a two-line message, you will let him know just how much you treasure him, not just on Father’s Day, but every day of the year. Let him know every day is Father’s Day you. 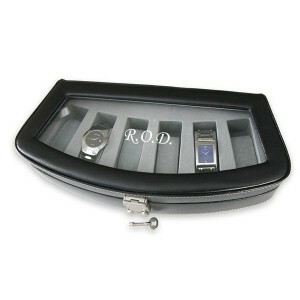 This elegant 6 watch case is perfect for the Fathers in your life. Featuring a working lock to help to secure the time pieces he treasures, the case is constructed of brown or black leather with a quality glass locking cover. This Sophisticated Leather 6 Watch Case will be a gift to be cherished for years. Your love will be remembered every time the case is opened. Let your dad know how much he means to you with this quality acrylic plaque. 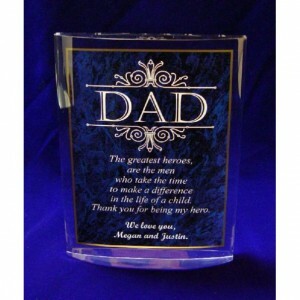 It has “DAD”, your name and your choice of poem laser engraved within the body of this attractive gift. He will beam with pride as he shows it to his friends on Father’s Day or any of his many very special days. Sophisticated yet practical, this credit card holder with money clip could be the gift you are looking for. 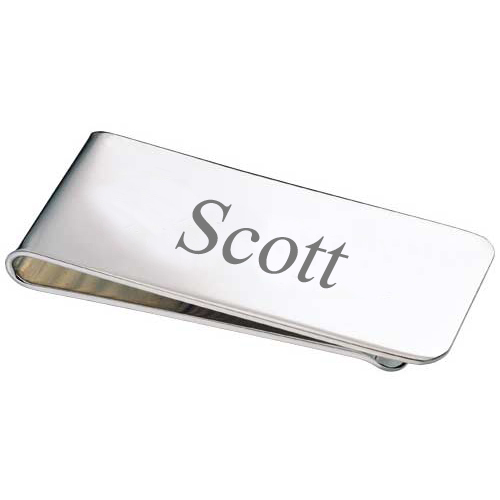 Engraved with his name or initials, he will be organized and be able to reach his credit cards or cash with ease. No more fumbling or rummaging through the bulky old wallet he carries in his pocket, holding up the checkout experience. Every time he reaches into his pocket to pay for a purchase, he will remember how much he is loved. This may the gift you are looking for. Your father can sit while enjoying a hot cup of coffee. He can proudly brag while he remembers how special Father’s Day was. 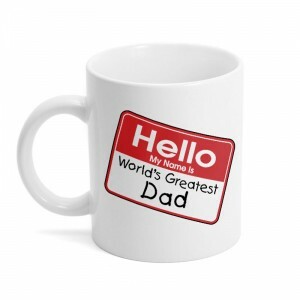 He will not forget how thoughtful this Father’s Day Mug, with the personal message from you on it. Packaged in a rosewood finished box, these Wild West Playing Cards are a gift that will be enjoyed for years. 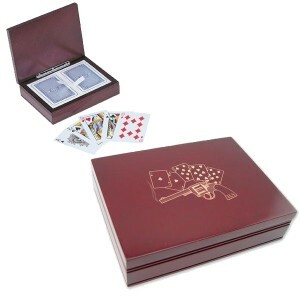 The box is adorned with an engraving of a western gun, and a deck of playing cards. This is the perfect gift for the dad that likes to play cards, or is a fan of westerns. The gun handle is engraved with dad’s initials for that added personal touch. Now deciding what to give the man who has everything will be a little easier. Let Memorable Gifts help you find the perfect gift for a dad that likes to golf, or travels the world for work. A personalized Father’s Day gift is the perfect way to express your love and appreciation.